Taganga is a small fishing village 5km north of Santa Marta at the Caribbean coast in Colombia. Taganga is a great and idyllic fishing village. Many tourists, local and international, visit this beautiful place every year. It has great charm and the surrounding attractions are plenty. Although Taganga is a popular place to go, it has also its share of problems, mainly with the infrastructure and public services. There has been a prolonged drought in the area, so water pressure is very low, sometimes non-existent. Many hotels, businesses and residents have their water delivered in tankers. Be careful when you walk alone at night or in remote areas. Frequent minibuses (colectivos) go from Santa Marta Bus Terminal via the city center to Taganga for COP$1,600 p/p, or COP$1,700 on holidays and sundays (May 2017 prices). To catch this bus from the terminal, exit out of the main entrance and walk to the busy highway, then cross to the opposite side and wait. There is one every 15 minutes or so. It's about 15 minutes from Santa Marta Historic Center (or about 30 - 40 minutes from the terminal) and a beautiful ride. You can get off at the Mirador of Taganga and walk down to town (25 minutes). You cannot get a minibus back to Taganga from the main beach in Santa Marta (Carrera 1), because it is one-way. To go back to Taganga you have to take the minibus from 5th Avenue (Carrera quinta). Taxi fare from the bus terminal of Santa Marta to Taganga starts from COP $12.000 and from Taganga to Santa Marta it is $10.000 (standard rates). It raises $2.000 on Sundays, holidays and at night. From Santa Marta airport the fare is COP$40,000, and the ride takes about 30minutes. For cruise ship passengers arriving in Santa Marta there are plenty of taxis and mini-buses waiting in a gated police controlled area to take you around town. From Cartagena there are shuttle services that directly go to Taganga for COP $45.000. You can avoid the long way to the bus station in Cartagena and the transfer in Santa Marta bus station. Taganga is surrounded by beautiful desert mountains covered in natural flora and fauna. 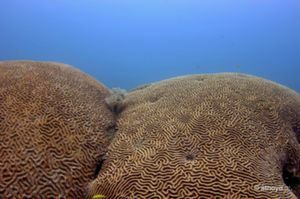 There are millions of lovely fish and corals which can be reached by short walks and snorkeling out to corals. People watching and good mellow times are to be had along the beach road and loads of beautiful tourists. There is only one ATM in Taganga and as there is a high demand of cash, it often runs out of money. It also does not work with all types of foreign cards, some banks cards do not work, despite the ATM having VISA/Mastercard symbols. If you run out of cash just take the bus to Santa Marta and get off along the street next to the beach, there are several large banks near here. In addition, many hostels and dive shops also accept credit card payment (although there may be a surcharge). The main beach is shared with the harbour of Taganga. It's small and simple but good for swimming. It is very crowded with Colombian tourists on weekends. A 15 minute walk north of town lies Playa Grande, definitely better than Taganga's beach but maybe even more crowded. It is also possible to take a boat to get there (from COP $5.000 per person round trip) or one of the more remote beaches in Tayrona Park like Bahia Concha, Chengue and Playa Cristal (from COP $50.000 to $80.000 per person for a round trip). Real unspoiled paradise. Ask the fishermen. The trail starts from far right of Taganga beach. A longer walk goes to Bonito Gordo and from there to Bahia Concha. Reserve a full day for this and ask around to decide if you need to contract a local guide. You can spend the night at Bahia Concha, but you may need to take your own hammock. The beautiful beach of Cabo San Juan del Guía in Parque Nacional Tayrona is about a 1hour boat ride away (COP$40,000) - boats leave a couple of times a day when full, inquire in town or along the beach. You can also be in Minca, a small town in the Sierra Nevada above Santa Marta, in less than an hour. You can get there by shared or regular taxi. Shared taxis leave from "Estacion de Minca", near the mercado in Santa Marta. A direct taxi should cost from COP$35,000-40,000. Many tour operators in town also offer a one-day all-inclusive tour, including waterfalls, a spectacular mirador and coffee plantation/factory. Taganga turned in to a popular scuba diving spot. Diving spots are usually near the small island "Aguja", a part of Tayrona National Park. The underwater of Taganga has a big diversity of marine life. There are a dozen diving schools in town, but be careful where you do your courses. There are many reports of travelers doing their courses, paying and never receiving any certificate. Be careful for your safety: some diving centers have pretty old equipment, never follow safety rules such as safety-stop and even skip important skills/exams during the course or have dive masters teaching courses, check if you will be with a real instructor. For more information check PADI alerts . Prices for a half day with 2 dives all equipment included are between COP$150,000-250,000. Open Water courses are among the cheapest in the world, between COP$750,000-1.000,000 (January 2018 prices). Delphinus Freediving Club operate out of Octopus Dive Center, instructor Carlos Correa teaches CMAS certified courses. You can do a 2-day course and get a 2* certificate (3minute static apnea, 20m dive) for as little as US$155 (January 2015), much cheaper than similar courses elsewhere. Not terribly responsive via email. Fundación Calipso Dive Center Calipso Dive Center and Tayrona National Park in Taganga Colombia are running a midwater marine nursery to recover species of corals around the marine area, control lion fish, educating the local fisherman and monitoring the coral reef. This is a opportunity for volunteers to enjoy scuba diving and support conservation. Volunteer in Coral Conservation Program Santa Marta - Taganga, calle 12 No. 1 - 40 Tel. (0057-5) 421 9146. Get homemade seasonal sweets and delicious frozen fruit treats at Kelly seasonally. And check out the handmade Wayu and Kogi shoulder bags. Excellent crafts and very Colombian! There are many local stalls with the usual arts and crafts, hammocks, bags, etc. Be prepared to bargain hard, but still expect to pay much more than at the market in Santa Marta - Taganga is a tourist town! Literar-té A book exchange/bookstore with a good collection of books in English (and other languages). Uphill after the police station and past the football field, follow the signs from there. Try the delicious streetfood along the main beachfront and at the other stalls dotted around the town - arepas, empanadas and more! Eat lunch in one of the local restaurants away from the beachfront, "Menu del Dia" should be no more than COP8,000 - a bowl of soup, a juice, and chicken/beef/fish with rice, plantains, beans and salad. Republika Taganguera, French Restaurant/Bar. Tel. (0057-5) 421 90 92. Located in hostel Divanga, with nice swimming pool and just 4 blocks straight up from Delfin Hostel on the beach. Good vibes and Great French food. Taganga Xtreme, Nice place on the beach front. Have (beach) clothes as well. Great coffee but bad service. Che Luis, Usually very crowded with locals and Israelis. Mostly an Israeli place and very loud as well. A lot of food for little money, but not the best quality though. El Reef, Cra. 1 No. 15 - 09. Near the beach. Great panini sandwiches and good salads. The speciality: good waffles with ice cream and nutella. Bitácora, Nice place on the beach front. Looks always crowded. Try the "Pescado Marinero" for an excellent dish (comes with a colorful side salad and self made fries. Maracuja juice (con leche) is also recommended. This may be a seasonal advice (true for September): beware of small (and not eatable) but nevertheless painful fruit falling from trees above if you get a seat not covered by the roof. PachaMama, Nice tapas restaurant near the church. French chef. Baguettes de Maria, Maria is a nice lady who makes great baguettes. Located near the soccer field. Pomodoro, Small local restaurant near the soccer field. They offer pizza and local food. Cactus, A kiosk on the beachfront. Very local. It would be good idea to take a couple of "Stubbie Coolers" (Australian vernacular for an item which keeps the beer in your bottle cooler or longer) as the heat in Taganga will have you drinking warm beer by the time you are at the end of your drink (or just don't hold your bottle when not drinking from it and don't take half an hour to finish each bottle). Another option is to ask around for an apartment or room to rent. There are gringo shacks and rooms for rent all over town. But be carefull; most of those places to stay do not have running water and you never know who has another key. Taganga has a long history of people's belongings disappearing as everyone in town often have keys and people lose stuff the day they are scheduled to leave. There is always the option of find a person who's renting a room in their house, or seeing who's out of town and turned their home into a temporary guest house. If you do this, be sure you trust where you are staying, and bring your own locks as a precaution. Also, Taganga has no water due to political issues, so there are times where water can be an issue. Most of those renting places are ilegal. They do not have permision to rent out those rooms. There is a great little internet cafe a block to the west of the police station and ATM, which adds little friendly touches like the occasional cup of water. Taganga has recently become notorious for mugging and robbery, so regular precautions should be taken. There are quite 7 small beaches outside of Taganga (15 minutes walk), which are connected by walking paths covered by vegetation. These paths are used by local robbers, especially on late hours when there are not many people walking to and from. Do not walk there by yourself. Wait for a small group. If you carry valuables with you and don't feel adventurous, it's better to take a boat (3 minutes; COP $3.000). If you consume illegal/recreational drugs (you can't walk down the main beachfront street without being offered them multiple times) be careful of getting shaken down/searched/harassed by the local police. If they find anything on you be prepared to be taken into custody and threatened with jail unless you pay an on-the-spot fine (in cash, of course). Anyone traveling with you is also subject to harassment and could be made to contribute to your "fine" as well. Know the law - marijuana has been decriminalised in Colombia - but it is still wise to exercise discretion and caution and may less hassle to pay a small fine if caught by the police. Santa Marta airport can be reached by either Taxi or Regular Colectivo. Direct flights to Medellín, Bogotá and elsewhere. Taxi is a 30-40 minutes journey and will cost about $40,000 COP. You could catch the Collectivo Bus out of Taganga past the Santa Marta beach front till it gets to the corner of Carrera 4 and Calle 22. Here change buses to one marked Rodadero Aeropuerto, which will take you directly to the airport for 3,200 COP (60-90 minutes). Ciudad Perdida — Taganga, even moreso than Santa Marta, is the main jumping off point for the famous trek, and you should be able to arrange a trek on short notice with any of the hostels or tour companies dotting the main road. Tayrona National Park — an unspoilt natural paradise of jungle, birds, ocean, and absolutely gorgeous beaches. A boat leaves for the backpacker beach haven of El Cabo every morning around 10AM.